Investors have been preparing for the inevitable rise in interest rates ever since the Federal Open Market Committee (FOMC) lowered them in 2008-09. Now, after years of historically low interest rates and what many are calling a recovered economy, it seems likely that the FOMC will raise rates. 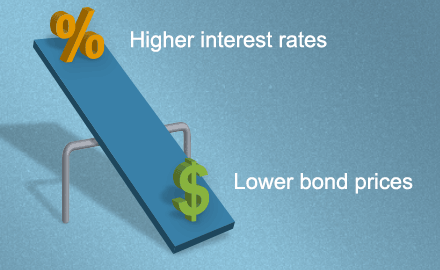 It's important to know about the seesaw and duration-sensitive relationship bond prices have with interest rates to prepare for the inevitable change if bonds are part of your 529 plan account. When interest rates increase, bond prices decrease. This isn't anything new for bonds. Interest rates haven't increased for a while and you may never have encountered this investment risk if your first investment in bonds was in the last 7 years. It's most likely that rates will rise gradually. This means you could see a slight or moderate dip in the overall value of your investments depending on how much of your 529 plan portfolio is in bonds. Portfolios with more allocated to bonds and age-based portfolios that are in a conservative phase could see a bigger dip than portfolios with more stocks. How much you have invested in bonds is one part of the equation that will affect the value of your portfolio when interest rates rise. Another factor is the measurement of how quickly a bond will repay its true cost. This is known as the bond's duration, and it measures a bond's—or a bond mutual fund's—sensitivity to interest rate changes. Investment managers choose bonds with varying durations for the portfolios they manage. When interest rates rise, prices drop more for bonds with a longer duration than those with a shorter duration. For example, if a bond has a duration of two years, its price will fall about 2% when interest rates rise one percentage point. One with a duration of 5 years will see a 5% price drop when interest rates rise 1%. The extent of the decrease in your portfolio value depends on how much of your portfolio is invested in bond funds and the underlying funds' durations. Here's some good news for many of you: If you've been invested in a well-balanced portfolio over the last few years, you likely benefitted from the stock market surge that helped increase the value of your investments. If you had stock investments in 2008, you know first-hand the kind of risks involved with stock investing. Those who have stayed invested since then and added more to their stock investments know the long-term benefits too. There's no guarantee strong stock market returns will continue. However, if you have a mix of stocks and bonds in your portfolio, like in the 529 plan age-based options, future stock gains may help offset any losses from an interest rate increase. Now that you know the changes that can happen in your portfolio with bonds, it doesn't mean you need to do anything about it. If you're not comfortable with even a small change in value, call 888-672-9116 to talk to someone about the right move for your 529 plan.